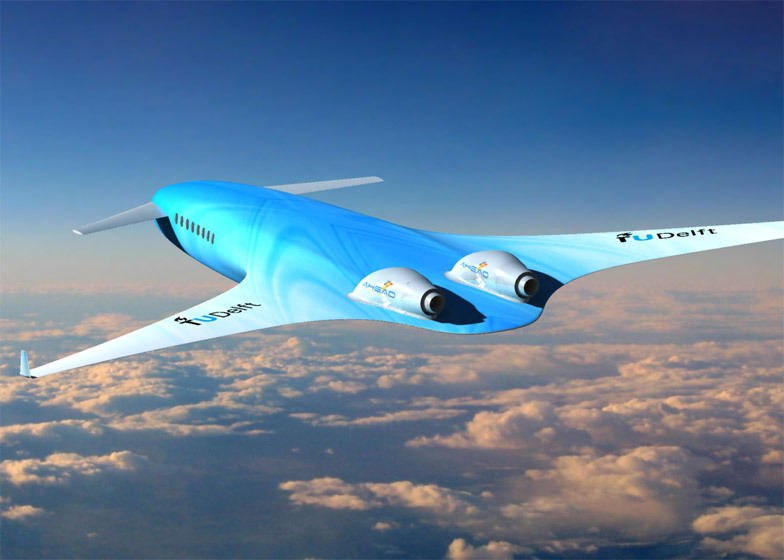 Dutch airline KLM and Delft University of Technology have released concept designs for an aircraft with a "blended wing body", which could transport passengers non stop from Europe to Australia. The AHEAD aircraft, which stands for Advanced Hybrid Engine Aircraft Development, would carry 300 passengers over a range of 14,000 kilometres – approximately the distance from Amsterdam to Perth. The continuous profile is designed to improve air flow over the aircraft and reduce drag, which planes currently overcome by using more engine power, and therefore more fuel. "A blended wing body is one of the very promising designs to minimise the drag and, is so doing, making aircraft much more fuel-efficient," said KLM engineer Rob Duivis on the company's blog. The team is also proposing a hybrid engine to replace conventional turbofan engines. In turbofans, large volumes of air flow through and around the engine, then some of the air is used to burn kerosene fuel in a combustion chamber. The heated air then drives the turbines that propel the vehicle forward. KLM's new engine would use two different combustion systems. The first burns either cryogenic hydrogen or liquefied natural gas (LNG), and the second burns either kerosene or biofuel. "By using two different combustor and fuel systems, the engine's total efficiency increases and emissions are reduced," said Duivis. A counter-rotating fan is another feature of the new engine. Comprising two rows of blades that rotate in opposite directions, the large fan would produce most of the engine thrust. To further reduce drag, the engines would be mounted onto the back of the aircraft beneath curved pods rather than under the wings. "The AHEAD design is a long-term study, with many aspects yet to be researched," said Duivis, who predicts that an aircraft of this type would be introduced around 2050. KLM has previously worked with Dutch designers Hella Jongerius and Marcel Wanders to create cabin interiors and tableware. Ideas for improving aviation vary greatly in scale and plausibility. Among the more practical suggestions are folding seats patented by Airbus and Priestmangoode's plans to add larger overhead compartments. More extreme proposals put forward recently by designers include using OLED screens to make aircraft cabins appear see-through, and a hybrid car and plane that can be used both on roads and in the skies.